I think I've got all the players with different logins combined together so the corrected results have been posted. Please let me know if you notice any others that are still separated in the list and I will be happy to correct them. GNPaul was bumped to 4th place after combining WLV.ES Robert's two scores together; and will be awarded the prize for being in the top 3 instead of GNPaul. Check out the updated stats (those with dual logins are combined) and compare to the original stats (those with dual logins separated) to validate the results. Thanks again to the nearly 50 players that participated in our tournament that spanned the entire decade of TrackMania! 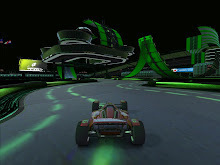 Make sure you also participate in the many festivities that will happen on 14 December, the official celebration day of the 10th Anniversary of TrackMania.